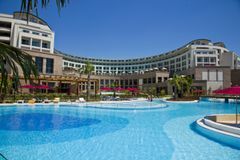 The Kaya Palazzo Golf Resort is a superb 5* hotel, located right in the heart of the popular golf destination of Belek, Turkey. It offers world-class service in a location on the banks of the Turkish Riviera with stunning views out over the Mediterranean Sea and easy access to some of the best golf courses in the region – making for an excellent option for a golf holiday. We found 9 offers matching your search. Kaya Eagles is a special new addition to the golfing landscape of Belek, where the phenomenal native pine forests set the scene for a majestic championship course that looks set to establish itself as one of the finest in Turkey's golfing capital. Some 750,000 square metres of spectacular pine forest are the backdrop for Kaya Eagles, which is among the most recent courses to be unveiled in Belek. Master PGA Professional David Jones set out to create a course which is not extremely long like many of the recent international, but would provide a strong challenge for every player. At its peak, Kaya Eagles is less than 6,500 yards long, but the imaginative design ensures that visitors are faced with demanding yet beautiful holes that are certain highlights of any golf holiday in the popular Belek region. There are a total of 641 guest rooms at Kaya Palazzo Golf Resort (493 in the main building, 140 at the garden area and 8 villas). All are comfortable and spacious, as well as being well equipped with: bathrobe & slippers, hairdryer, telephone, complementary Wi-Fi, central air-conditioning & heating, mini-bar, tea & coffee making facilities, satellite TV and an electronic in-room safe. In addition to the open buffet style restaurant, which serves a superb range of international cuisine, the resort also boasts a number of great a al carte restaurants, ranging from Lebanese, Middle Eastern, Mediterranean, Italian and Turkish, as well as a lively Steak-House. All are able to boast great locations with stunning sea views. There are also a number of bars and light snack restaurants serving both Turkish and international dishes, 24 hour room service and a kids restaurant. Kaya Palazzo Golf Resort is able to present its guests one of the most stylish Spa and Wellness facilities in the whole of Turkey. Offering a range of facilities, this Spa covers an area of 3,500 m2 and is designed around the historical Ottoman theme, also combining Turkish, Finnish and Russian characteristics. The hotel is also perfect for those who are looking to keep fit, with a comprehensive Fitness Club designed specifically those of a sporting nature. There are tennis courts and football fields.